As we’ve studied the rebellion of Absalom, we’ve been asking what we can learn about responding when we sin, understanding the discipline of our heavenly father, and how to respond when suffering unjustly. With 2 Samuel 17 we focus on these questions from God’s perspective. David’s son Absalom has declared himself king and lured one of David’s top advisors, Athithophel, to his side. David has fled Jerusalem with a small band of servants and foreigners. To secure his claim to the throne, Absalom sleeps with David’s concubines on the roof of David’s house. This abominable actionremoves any possible diplomatic or peaceful resolution. As we resume up the story in 2 Samuel 17, Absalom considers his options for eliminating the last obstacle between him and the throne of Israel: his father David. Athithophel knows David is traveling with women and children and cannot move quickly. Athithophel proposes a 4-step plan: 1) Ahithophel will select an army large enough to ensure victory, but also large enough to implicate all of Israel in the coup, and with these men he will purse David immediately; 2) He will strike David and his followers before they have a chance to organize, throwing them into panic; 3) He will execute only David, minimizing the casualties; and 4) With David eliminated, his supporters will have no reason to continue the war. Absalom then calls David’s friend Hushai for a second opinion. Hushai invokes an arsenal of metaphors designed to remind them of David’s many military victories and make the young upstart — who has never been in battle — question whether his ability to tackle mighty men who are experts in war (2 Samuel 17:5-10). Hushai appeals to Absalom’s vengeance: Why not wipe out all of David’s followers? 2 Samuel 17:14 is the literary center of the text. Though God is active and furthering His kingdom plans, His actions are hidden from our heroes. 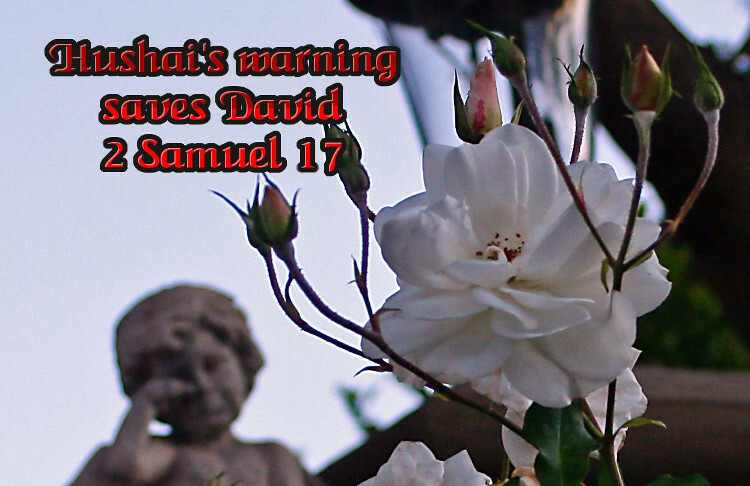 Hushai must warn David not knowing which plan Absalom intends to follow. An intricate spy network is set in motion to inform David. Word passes from Hushai to the priests Zadok and Abiathar, and from them to an unnamed female servant, and from her to Jonanthan and Ahimaaz, the priests’ sons. Recognizing that Absalom’s chances for victory are slim, and when Absalom is defeated, Ahithophel will be executed as a traitor, Ahithophel hangs himself, foreshadowing Judas who will betray Jesus Christ and then take his own life. David is protected by a variety of faithful servants — both named and not named — who risk their lives for their king. Yet, neither David nor Hushai nor Absalom know what God is doing. This story illustrates Paul’s point in Romans 8:28-29: because of the activity of the Spirit, we can have confidence that everything that happens to us is in our own best interests. God is NOT absent, even if His plan is NOT obvious. Sometimes we underestimate the many and variety of ways God can and does work. Sometimes we are the hero and sometimes we are the unnamed servant on the Lord. We may miss our own contribution to the kingdom.